Answering Muslims: Cage's Asim Qureshi Exposed on "BBC This Week"
Cage's Asim Qureshi Exposed on "BBC This Week"
The London-based Islamist organization Cage is similar to CAIR in that both masquerade as civil rights groups while attempting to thwart criticism of Islam and remove obstacles to global jihad. In this clip from "BBC This Week," CAGE director Asim Qureshi is thoroughly exposed as a stealth jihadist. The Telegraph—The director of the Muslim rights group Cage has repeatedly refused to condemn the stoning of adulterous women by Islamic extremists. Appearing on the BBC’s This Week programme, Asim Qureshi was asked about a series of positions advocated by a Muslim scholar he has described as a mentor, including female genital mutilation, domestic violence and the stoning to death of women found guilty of cheating on their husbands. 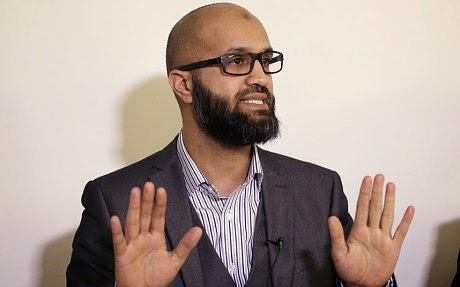 Last month, Mr Qureshi was criticised for describing Mohammed Emwazi, the Islamic State executioner known as Jihadi John, as a “beautiful young man”. Pressed by Andrew Neil, the show’s presenter, to condemn a series of extreme positions, including claims that Jews are descended from pigs and homosexuality is evil. Accusing him of using “weasel words,” Mr Neil put it to Mr Qureshi that he had in the past spoken in favour of Jihad and Sharia law. He said: “As far as I am concerned, Sharia law isn’t practised correctly anywhere in the world. Could you please give clarification as to which Surahs and or Hadiths that support "Stealth Jihad". Facts about Christianity and Islam. Since we (Christians) have now been justified by Jesus Christ’s blood at the cross and be saved from God’s wrath for our sins, do we need any more prophet/s after Jesus Christ to save from God’s wrath for our sins? We know that wages of sin is death, that is burning in hell fire for rest of our eternal life. There is no exception for anybody for this punishment. But we also know that God is Kind and Merciful by nature and love us though we are weak in committing sin again and again. He does not like us dying in hell fire and cry for mercy helplessly in hell fire. Out of His kindness and love for us, He saved us from burning Hell fire for our life eternal. He saved us allowing His only begotten Son to be tortured and be killed by evil force of the world like a sacrificing healthy lamb offered for sin forgiveness in the past. Jesus’ blood saved us once for all. We need no more blood of healthy animal for our sin forgiveness, as Muslim believes by animal sacrifice in Qurbany Eid. Do we need after Jesus Christ, Muhammad the Muslim prophet again to save mankind from wrath of God by sword? Muhammad called for Jihad to fight against God’s people to establish devil’s rule of laws thru Sharia Laws. The Bible says God does not drink blood. Loving God be pleased by supreme sacrifice not by sword as Muhammad prescribed, after Jesus’ sacrifice at the CROSS. Muslims fail to understand why God being supreme authority allow Jesus to be tortured and killed by evils of the world. Islam is a path to destruction of souls, believe it or not! David, time for a video on tqiyya to explain to the audience that lying to the kuffar is okay. Another video of muhammadan cultural and societal destruction of kafir nations in lieu of the latest muslim atrocity; destruction of artifacts and idols. Muhammad set quite an example in mecca when he rid it of pagans gods. QUOTE “He said: “As far as I am concerned, Sharia law isn’t practised correctly anywhere in the world. The next question should be, WHAT does the LAW says. Are Apostates being killed? And then WHO is working on to REMOVE ALL the passages in Sharia which are not confirming the UN human rights. And IF SHARIA agrees with the UNIVERSAL HUMAN rights why the NEED for Islamic Sacred Law? Furhter if only SECTIONS of the Law are implemented are they NOT in denial of the UN-Rights? The Worst Sections in the Law? Like Killing The Apostate? His PERSONAL OPINION does NOT matter, the contents of the LAW do. This television exchange spawned the hilarious #imnotatheologain Twitter hashtag. How does one who is not a theologian claim to judge every Islamic ruled country in the world? There is such a lot of talk about ISIS and others damaging the image of Islam, but it seems to be many self-acclaimed moderates like this man, are doing quite a sufficient job without the help of so-called militants. Muslims should definitely ask why are men such as this the spokespeople for a faith that insist that it is coherent and accessible. The clearest and most undeniable statements that he made were the questions he skittishly avoided and left unanswered.